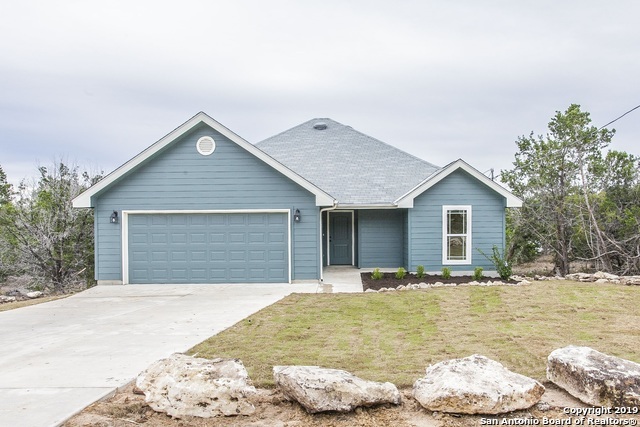 All CYPRESS COVE COMAL homes currently listed for sale in Spring Branch as of 04/18/2019 are shown below. You can change the search criteria at any time by pressing the 'Change Search' button below. "Enjoy breezy summer nights relaxing on your wraparound porch in this beautiful custom built home. Impressive features include a 15 foot gambrel ceiling in living and rich wood-look laminate flooring. Great kitchen full of high-end granite, Knotty Alder cabinetry with soft-close drawers, GE appliances, big walk-in pantry & breakfast bar that seats four. Downstairs master in private wing has tray ceilings & full master bath with walk-in closet, tiled walk-in shower & granite topped double vanities"
"Enjoy the picturesque views of the Texas Hill Country from this amazing second story deck. Overlooking the treetops and panoramic views, this home features a storybook setting. Do you enjoy entertaining, be sure to imagine yourself in the newly redesigned, open-concept kitchen. You can relax in the upgraded bathrooms after a day of enjoying your property of over half an acre. There is also access to the Guadalupe River, as well as a fishing pond to spend the warm Texas summers at. 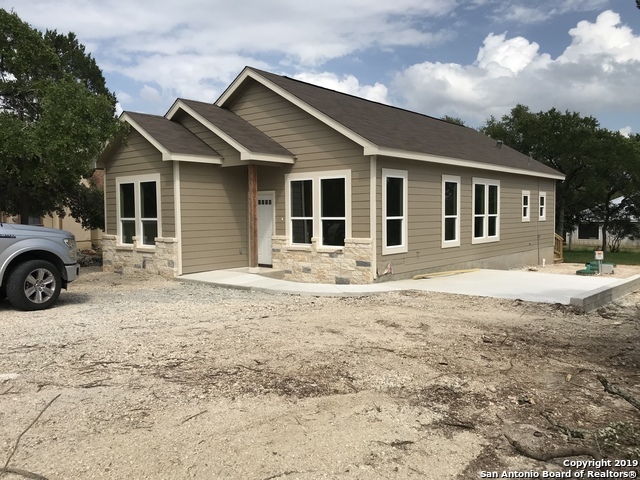 Come and "
"**Beautiful One Story Contemporary Home**1/2 Acre**Flat Lot**Tile On Main Areas**Carpet Only in Bedrooms**Granite CounterTops**SS Energy Star Appliances**Great Location**Easy Access to 306/281/Blanco/New Braunfels/San Antonio/San Marcos** Will Be Completed Mar/Apr 2019**"
"New construction 3 BR 2 Bath home in Cypress Cove. Stainless steel appliances, granite counter tops, attached two car garage with concrete drive, open floor plan with split master bedroom. 14 SEER A/C, radiant barrier, R38 insulation in attic, double glazed low E windows, and more. (See associated docs for list of features.) 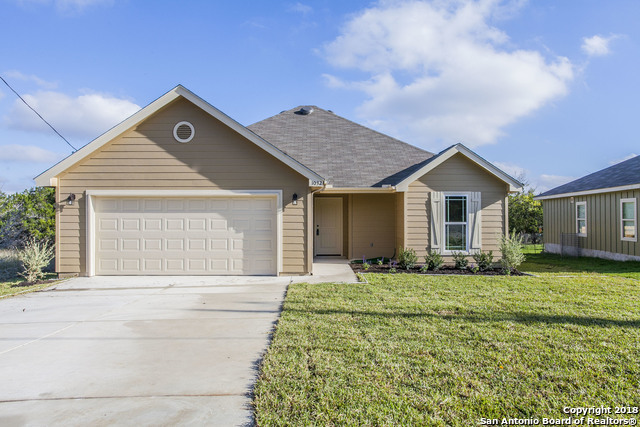 Low HOA dues, private park and boat ramp, top ranked Comal schools. Move-in ready!" "Newly constructed single story home 3 bedrooms 2 bath open floor plan ceiling fans and low E windows tile flooring through out 10' ft ceilings stainless steel appliances , granite counter tops. custom kitchen cabinets and many more extras. SHOWS GREAT!" "Enjoy quiet Hill Country living in highly desirable Cypress Cove Subdivision. The high ceilings and open floor plan of this well maintained home are perfect for entertaining. Sit on the brand new back deck and admire the mature trees and wildlife. Minutes from the boat ramp, pool, clubhouse, and neighborhood park with access to the Guadalupe River! GREAT VALUE-WON'T LAST!" "BEAUTIFUL NEW HILL COUNTRY CUSTOM HOME on a gorgeous corner lot tucked away in the amazing Texas hill country. This 3/2 single-story bungalow style house features a dramatic large open floor plan with gorgeous vaulted 9' ceilings in the living & dining areas. It also boast Custom light fixtures, cabinets, stainless appliances & granite counters. A magnificent private master suite is located in the rear for privacy. Two additional bedrooms share a hall bathroom. Covered front & rear porches & gr"